Covers the basics of compiling, deploying, and data storage to GAE's specialized capabilities and supporting frameworks. Google App Engine is a Cloud Computing SDK, API and Platform that makes Google's publicly recognized scalable infrastructure available to any size development shop. The App Engine platform is available for two languages at this time: Python and Java. 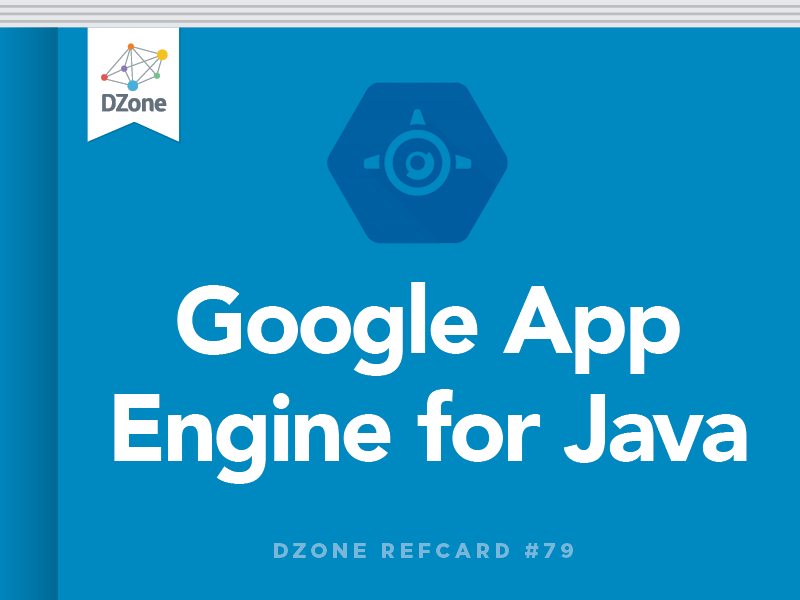 This Refcard specifically focuses on the Google App Engine for Java, which will hereafter be referred to as GAE/J. The Google App Engine platform inherits many characteristics and technological benefits of proprietary Google applications. These also include modest programming constraints and the absence of a traditional file system, but in return the developer achieves almost guaranteed horizontal scalability. Horizontal scalability is the desirable application architectural achievement of being able to "just add more servers" to achieve ever greater throughput and user loads. Vertical scalability, in sharp contrast, is the adding of capabilities to a fixed number of servers, such as increasing their CPUs, adding more DIMMs of memory, or installing larger hard drives. In return for the programming constraints of the GAE/J platform, it offers automatic load balancing, fault tolerance of failed servers, centralized logging, data replication (safety) and user-invisible incremental-version deployments across all servers hosting your application. GAE/J offers inquisitive developers a free base platform on which to host Java 5 and Java 6 Web Applications. GAE/J nodes run a custom version of the Jetty Servlet Container. This custom servlet container whitelists certain JDK classes, and blacklists others that would break the scalability of the Google cloud computing infrastructure. Blacklisted classes include java.lang.Thread, java.io.FileWriter, and the whole of JNI. The GAE/J SDK is a set of JARs (the core utilities are written in Java), shell scripts (SH and CMD) and example applications stored in a zip. Just as with any other command line toolset, it is recommend that you set a "home" environment variable that defines the root of the unzipped SDK. For GAE, it is recommended to set the environment variable APPENGINE_HOME to the top-level folder containing the GAE/J SDK. A fair amount of forethought was put into versioning of the SDK and apps bound to a given version of the SDK, and one of those facets shines through in that multiple SDKs can be installed (though only one is pointed to by the environment variable) at any given time without conflict. A version of the Jetty Servlet Container is included with the GAE/J SDK and is used for local development/test deployments. It replicates many facets of the true GAE hosting environment, but deviates slightly in others. For example, request timeouts and class blacklists are not enforced on the local development server. Developers need to keep this in mind and test their application on the real GAE servers as a final step prior to public announcements. The simulator, which launches at http://localhost:8080 by default, even locally mimics Google account logins, if the integrated authentication options are used, and provides a BigTable datastore browser to review and edit test data. Every application requires the reservation of a globally unique name called an "App ID" prior to its first deployment. App ID reservations are performed through the control panel at http://appengine.google.com. The administrative web app facilitates searching for unused application names and secures your choice once a desired and available name has been found. Free accounts are limited to 10 App IDs. App IDs are immutable, and even if deleted, are not currently recycled for reuse in the global available name pool. Maven support for GAE/J is a developing story led by the open source community. Efforts on a native Maven plugin for GAE are unfolding at http://code.google.com/p/maven-gaeplugin/. The SDK shell scripts can also be reused via the execmaven- plugin. Example POMs using the SDK shell scripts can be found at http://github.com/matthewmccullough/googleappengine-nfjs/tree/master/gae-maven-parent-pom/. Google has spent significant research funds and time to develop a non-relational data repository called Bigtable. This is the petabyte-capable technology behind the datasets for the Google web search engine and Google Earth. The research paper on Bigtable outlines the fundamental approaches and difference from traditional relational database (RDBMS) implementations. GAE gave public developers their first broad access to Bigtable technology through a user-friendly abstraction named Datastore. Datastore has only slight similarities to a traditional relational database and in fact shares more characteristics with so-called "object databases." Even with the dissimilarities to RDBMSs, having a vocabulary map offers a means of gently approaching the new terminology and concepts of Datastore's non-relational storage facilities. Datastore has its own Google Query Language (GQL), very similar to SQL, but with greater syntactical constraints. The traditional keywords SELECT, WHERE, AND, FROM, IN, ORDER BY, DATE, LIMIT and OFFSET are all supported in GQL queries. Much like its relational database cousins, Datastore offers indexes to speed query results when sort order or limiting clauses are specified in a GQL statement. However, given the potential massive scale of Datastore Entities, Indexes are actually required for any and all WHERE and ORDER BY queries. Datastore automatically builds two indexes for every entity's property each time a new entity/property combination is encountered in a persistable object. These automatic indexes include an ascending and descending index on each property, which satisfies the following common queries. For any SELECT beyond these simple queries, custom indexes must be constructed. The GAE team formally calls these "composite queries." For this advanced level of development, GAE gives you significant tooling to make this as easy as possible. Manually written custom indexes are stored in the WEB-INF/datastore-indexes.xml file. This config file has a switch, autoGenerate="true", that enables GAE to automatically author indexes for composite queries run in the developer simulator server. These automatically generated queries are stored in WEB-INF/appengine- generated/ datastore-indexes-auto.xml. The resultant set of available indexes is the union of these two XML files. When an application is uploaded that contains these custom queries, GAE puts the index creation tasks onto a global work queue, shared by all applications. The index is then shown as in a "Building" state. This is often imperceptible and your index will be created within minutes. However, during heavy load times and as your datastore record count grows, index creation time can significantly increase. Once the index construction finishes, the index is shown in a "Serving" state on your Control Panel's Index page. Scalable web applications, even prior to GAE, have begun to make increasing use of in-memory caches to rapidly serve expensive-to-constuct results to clients. GAE/J offers both a low level API as well as a JSR-107 JCache API to place objects in this simple key/value repository. It is your application's responsibility to determine what is most beneficial to serve from this cache as opposed to recalculating dynamically. Many modern web applications use email as a means to notify clients of order processing or sign up status. GAE/J provides a mail-sending JavaMail implementation. Image manipulation is such a frequent requirement of modern Internet-based services that GAE/J provides the native ability to resize, rotate, flip, crop and enahance images on the fly. Images are limited to 1MB in size and can be in a JPEG, PNG, GIF, BMP, TIFF or ICO format. Bear in mind that use of this helpful but Google specific image API results in tight coupling to the GAE/J platform. For applications that require the authentication of their users to perform certain secured functions, GAE provides an API to use Google's own authentication system. Users must have a valid Gmail address or username from any Google web application and can be assigned an administrative or user level role. Activities that can be worked asynchronously are a fit for the Task Queue. This can be likened to an extremely constrained version of Java Message Service (JMS). Task Queue requests can take a maximum of 30 seconds to complete, but techniques for chaining multiple tasks together to approximate a long-running process are emerging. Just like their UNIX cousins, GAE/J CRON Jobs execute on a scheduled recurrence. The requests to be called are declared in a custom file named cron.xml and are simply URLs to be invoked at the specified times. With instant messaging now a staple of communications, and XMPP the most open protocol, GAE/J impressively implements an API to allow web apps to participate in these IM conversations. The most common area of discussion around the GAE/J platform is the constraints placed on the application. Keep in mind that the GAE platform, moreso than other cloud computing frameworks, "forces" you to write scalable applications through these limitations. Nearly guaranteed scalability is an attractive benefit of the flexibility compromises. Each and every request, whether from a user-initiated HTTP request, a CRON request, or a Task Queue event has a maximum of 30 seconds to complete its execution. If it continues running longer than 30 seconds, a com.google.apphosting.DeadlineExceededException is thrown and the servlet is given a minimal extension to construct or redirect to a custom error page. All queries to a datastore are limited to 1000 rows of response data. Queries can have result sets that are greater than 1000 rows from an execution plan standpoint, but the query client only receives the first 1000 rows. All HTTP requests and responses (file uploads and downloads are the most common scenario) are limited to a maximum size of 10 MB. If a response is constructed that is too large, an error of "HTTP response was too large" is displayed. An ever-increasing number of Java frameworks offer support for the GAE/J service, and some GAE-specific ones are beginning to emerge. A robust listing of frameworks and technologies compatible with GAE/J is community maintained on the GAE/J Google Groups site. GAE officially supports the Eclipse IDE, but strong support for the NetBeans platform has also emerged in the form of an open source project plugin. The installation for Eclipse contains both Google Web Toolkit (GWT) and GAE support. Google feels that these are complementary technologies, but allows a user to select support for them independently during the Eclipse new project wizard. An equally rich GAE plugin exists for the NetBeans platform. It does not include GWT support, but does allow for the deployment of an application directly from the IDE to the production GAE servers. It also includes a visual form-based editor for the appengine-web.xml file. A GAE/J account is managed through a web control panel and provides utilties to visualize bandwidth, disk, and other resource usage. It also offers a GUI through which Datastore data records can be browsed, and arbitrary GQL statements can be executed. For paid accounts, metered resource thresholds can be set in terms of how much you wish to spend per day in each category of disk, bandwidth, IDEs CPU and emails. The GAE control panel offers a unified view into the log entries coming from all servers participating in your application cloud. The log entries can be filtered by time, severity, and string regex. Since Datastore is a specialized data store, a web interface alternative to traditional SQL tools is provided. Arbitrary Google Query Language (GQL) scripts can be run, stored data can be browsed, and individual rows can be inspected in detail for column data types and values. Many GAE developers and some of the Google engineers frequent the IRC channel. Special Google-sponsored chat events are also occasionally held in this virtual meeting space. Developers can review and search existing or log new GAE bug reports via the defect tracking web app. Be the first to know about new SDK releases and other platform events via the official GAE twitter feed. The community is constantly collecting links to the newest GAE/J resources that can be followed via the most popular social bookmarking sites. The Google App Engine platform inherits many characteristics and technological benefits of proprietary Google applications. These also include modest programming constraints and the absence of a traditional file system, but in return the developer achieves almost guaranteed horizontal scalability. Horizontal scalability is the desirable application architectural achievement of being able to \"just add more servers\" to achieve ever greater throughput and user loads. Vertical scalability, in sharp contrast, is the adding of capabilities to a fixed number of servers, such as increasing their CPUs, adding more DIMMs of memory, or installing larger hard drives. Just as with any other command line toolset, it is recommend that you set a \"home\" environment variable that defines the root of the unzipped SDK. For GAE, it is recommended to set the environment variable APPENGINE_HOME to the top-level folder containing the GAE/J SDK. Every application requires the reservation of a globally unique name called an \"App ID\" prior to its first deployment. App ID reservations are performed through the control panel at http://appengine.google.com. The administrative web app facilitates searching for unused application names and secures your choice once a desired and available name has been found. GAE gave public developers their first broad access to Bigtable technology through a user-friendly abstraction named Datastore. Datastore has only slight similarities to a traditional relational database and in fact shares more characteristics with so-called \"object databases.\" Even with the dissimilarities to RDBMSs, having a vocabulary map offers a means of gently approaching the new terminology and concepts of Datastore's non-relational storage facilities. For any SELECT beyond these simple queries, custom indexes must be constructed. The GAE team formally calls these \"composite queries.\" For this advanced level of development, GAE gives you significant tooling to make this as easy as possible. Manually written custom indexes are stored in the WEB-INF/datastore-indexes.xml file. This config file has a switch, autoGenerate=\"true\", that enables GAE to automatically author indexes for composite queries run in the developer simulator server. These automatically generated queries are stored in WEB-INF/appengine- generated/ datastore-indexes-auto.xml. The resultant set of available indexes is the union of these two XML files. When an application is uploaded that contains these custom queries, GAE puts the index creation tasks onto a global work queue, shared by all applications. The index is then shown as in a \"Building\" state. This is often imperceptible and your index will be created within minutes. However, during heavy load times and as your datastore record count grows, index creation time can significantly increase. Once the index construction finishes, the index is shown in a \"Serving\" state on your Control Panel's Index page. The most common area of discussion around the GAE/J platform is the constraints placed on the application. Keep in mind that the GAE platform, moreso than other cloud computing frameworks, \"forces\" you to write scalable applications through these limitations. Nearly guaranteed scalability is an attractive benefit of the flexibility compromises. All HTTP requests and responses (file uploads and downloads are the most common scenario) are limited to a maximum size of 10 MB. If a response is constructed that is too large, an error of \"HTTP response was too large\" is displayed.